For more than 40 years, BNP Paribas has supported the sport of tennis, sharing its values of fair play, responsiveness and high performance. Now the leading partner of tennis worldwide, the Group sponsors the sport’s biggest events and has created a global community of tennis fans through wearetennis.com, a website entirely dedicated the latest in tennis news. It all started in 1973, when the French Tennis Federation asked BNP Paribas to finance the construction of the center court box seats at Roland Garros Stadium. In recognition of this partnership, three letters appeared on the famous court cover: BNP became the official sponsor of the Roland Garros French Open, now one of the world’s foremost sporting events. 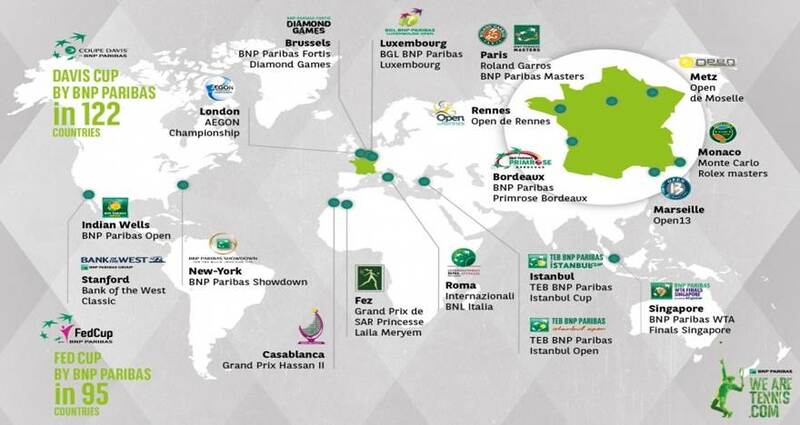 The Davis Cup and Fed Cup by BNP Paribas, the BNP Paribas Masters, the Monte Carlo Rolex Masters, the Internazionali BNL d’Italia, the BNP Paribas Open at Indian Wells, the Grand Prix Hassan II in Casablanca, the TEB BNP Paribas Istanbul Open and Cup and more. Roland Garros was just the first in a long series of partnerships with tennis tournaments and competitions all around the world. Beyond the highly publicized major tournaments, BNP Paribas has become the leading partner of tennis in all its forms. We support – and sponsor – men’s and women’s tennis, local, family and university events, international tournaments and parasports events. In 2011, BNP Paribas created wearetennis.com and its associated social networks, a platform entirely dedicated to tennis news providing a constant flow of information covering all players, all tournaments, all around the world. We Are Tennis also showcases all the enthusiasm of a committed sponsor eager to share its passion for tennis and provide fans with the opportunity to enjoy unique experiences. As title sponsor of the Davis Cup since 2001, the Group left a lasting impression on fans for the France-Switzerland final in Lille, in November 2014, through an unprecedented We Are Tennis package: an exceptional ad campaign, and a grandstand 100% dedicated to We Are Tennis for customers, employees and tennis fans. Our efforts helped achieve a record attendance for a tennis match with 27,448 spectators! Get complete tennis news and a dose of fun with We Are Tennis by BNP Paribas! Tennis, ATP, WTA, GrandSlam, Masters, DavisCup, FedCup.